Want to get even closer to nature? Try Camping in the park. 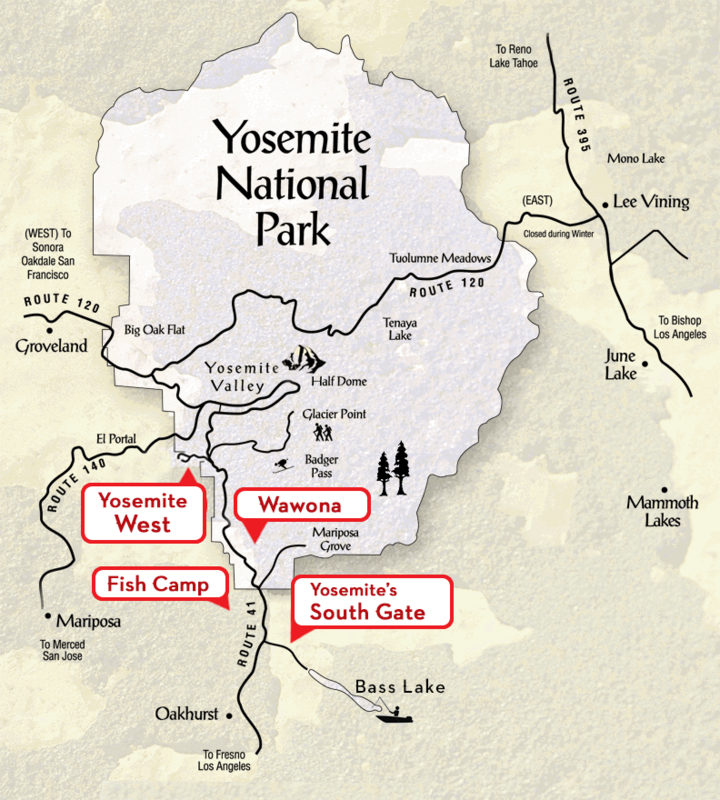 To experience the most of Yosemite, you should consider a backpacking trip into the park interior. Just a few steps from the valley, Yosemite's trails are beautiful and natural. Even in mid-summer, most trails are secluded and quiet, and you can see the park as it has existed for thousands of years. Camping in the park can be an overnight visit or a week-long trek, depending on the amount of gear you are willing to bring with you. But not much beats the smells of coffee and fresh-grilled fish around a campfire for pure satisfaction at the end of the day. Longer hikes can start in the valley or north off the Hetchy Hetchy Road or from Tuluomne Meadows. Backpacking or camping hikes can take visitors through forests, deep canyons, past alpine lakes and finally above the tree line up to snowy mountaintops. The Lyell Fork of the Tuolumne River is often the most crowded destination. Hetchy Hetchy is usually the most isolated, and is also highly-regarded for fishing. Trail maps are available widely in the valley and are inexpensive. Equipment can be purchased in the park, but you’ll save money by buying at home. Look for sturdy packs, lightweight sleeping bags and cooking kits, and water bottles. The best places to shop are outdoor stores which specialize in camping, hiking and climbing, such as R.E.I. Campers making overnight trips require free wilderness permits to minimize overcrowding on trails and reduce environmental impacts. The National Park Service provides wilderness permits on a first-come first served basis one day prior to or the day of your trip, or you can reserve them online in advance. Note: during the peak-season (May-September), the Park Service charges a $5.00 per person processing fee for reservation requests. Be careful; trails are not patrolled or maintained outside the valley. You are responsible for your safety. Stay on trails. It's safer and less damaging to the environment. Bring lots of water. If you acquire water from park springs, rivers, etc., chemically treat or boil it. Some trails follow alongside stream passages, so you may get wet, especially on falls hikes. Bring sturdy shoes, preferably with a heavy rubber "treaded" soles for traction. Lightweight athletic shoes and sandals may cause pain and blisters from a lack of support on uneven ground. You can dayhike with light hiking boots. Weather is sunny and warm during peak visiting months. It's not a bad idea to bring a sun hat to minimize exposure and overheating. Don't smoke on the trail. Smoking is permitted at campsites. Pack animals (horses and mules) have right of way on trails. Overnight campers should give a list of intended trail routes and scheduled stops with friends or family just to be safe. Cell phone service is available in some of the more populated areas of the park, but is not dependable. Do not expect a cell phone to operate in the wilderness. You might consider using “walkie-talkies” to keep in touch with party members on the trail. Pack out refuse, bury waste. Animals live in Yosemite. Be aware of your impact on them. If you drive to a trailhead, be sure to clean out your car before hiking off. Dispose of all wrappers, cans, bottles, cases or bags or packages which animals could mistake for food. Failure to do this could result in a very expensive surprise upon your return: a severely-damaged car. Be very careful when storing food to avoid attracting bears. Use park service metal storage containers when available, or hang your food to make it inaccessible to animals. Never leave food out if you are not immediately consuming it. Mosquitos can be a severe problem in the summer, especially at higher elevations (must be less for them to eat up there). Be sure to bring bug repellent and mosquito netting. Recent scientific studies have shown that Off® and other brands of repellent which contain DEET appear to provide the best and longest-lasting protection from insects.